QimiQ contains no emulsifiers or stabilisers and only has 15% fat, meaning lighter, healthier and tastier dishes. QimiQ can replace eggs, fat, cream and gelatine and enhances the taste of any added ingredients. Anything you make with QimiQ can be frozen, adding to its convenience. Also, QimiQ is UHT so there is no need to refrigerate. QimiQ is quick and easy and guarantees success. But most important of all, dishes with QimiQ taste delicious. QimiQ Cream Base is for hot and cold, sweet and savoury dishes. Lemon juice, alcohol or vinegar can be added to QimiQ without danger of curdling. QimiQ can be combined with almost all foods and can be used for cooking, baking and refining. Due to its unique cell structure created by the patented production process, QimiQ is able to emulsify with oil and butter. QimiQ Cream Base can drastically reduce moisture migration, slow down skin formation and discolouration and enables longer presentation times of the end product. Dishes remain fresh and appetising for longer, allowing easier pre-production. Ideal for sandwiches, spreads, dips, mousses and creams etc. 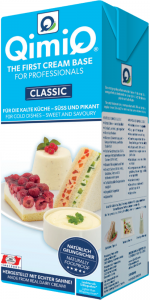 QimiQ is a dairy product consisting of 99% light cream and 1% gelatine, patented by Hama Foodservice GmbH. “QimiQ Sauce Base” (for sauces and soups). The product won a 2002 Mercury Award from the International Travel Catering Association. Contact Wallbridge for more information on our Sauce base / Diary filling. Fill in the form on the right hand side of the page and we will be in touch shortly.